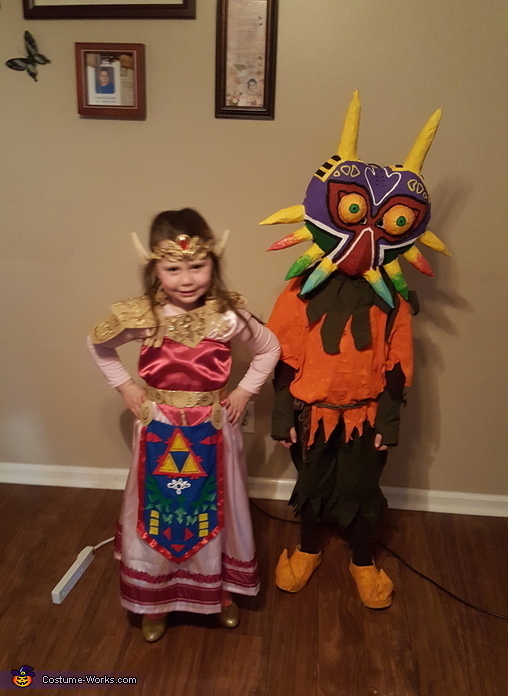 My son is the skull kid and my daughter is princess zelda and I went as the moon from majoras mask. We love video games and both my kids wanted to be characters from the same game so it worked out. Everything is handmade except for the elf ears. I used paper mache for the mask and paper mache and paper clay for the moon. I used paper clay also to make zeldas head piece.I used different materials to make their clothes. I made their candy buckets out of plastic fish bowls and added lights and wings to make them the fairies from the game. I do have basically the step by step pictures for all of it, but it's way to many pics to post.